Every hero has a beginning and this is definitely true for Wong Fei-hung in Rise of the Legend (2014). If you are a martial arts historian or action movie buff, then you know the name Wong Fei-hung, as there has been movies featuring the Hung Gar Master since the 1940’s. Probably the best known movies are Jackie Chan’s Drunken Master and Legend of the Drunken Master and Tsui Hark’s Once Upon a Time in China series, which made Jet Li famous. 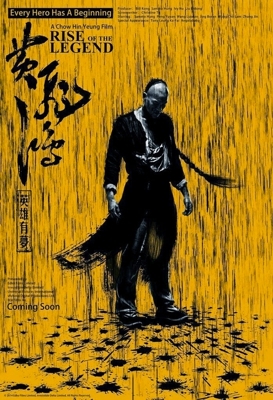 In Director Roy Chow’s new film, [Murderer (2009), Nightfall (2012)] Rise of the Legend, the Taiwanese actor Eddie Peng (Peng Yuyan) [Unbeatable (2013), Cold War (2012)] will play the folk hero and Sammo Hung [Ip Man 2: Legend of the Grandmaster (2010)], Boran Jing [The Guillotines (2012)], Luodan Wang, Cho-nam Wong [Ip Man: The Final Fight, Princess and the Seven Kung Fu Masters (2013] Big Tony Leung Ka-fai [Cold War (2012), Detective Dee: Mystery of the Phantom Flame (2010), Bodyguards and Assassins (2009)] Byron Mann [Cat Woman (2004)] and Angelababy [Tai Chi Zero (2012)] will also be in the film. Eddie Peng is not a lifelong martial artist, but he has trained like one for this film, spending months learning traditional Kung Fu and Sammo Hung, who served as the Fight Choreographer for the film, is said to bring us some epic fight scenes. The screenplay for Rise of the Legend (2014) was written by Chi-long To (Christine To) [Fearless (2006), True Legend (2010)] wife of Director Roy Chow. Rise of the Legend (2014) is being produced by William Kong of Crouching Tiger, Hidden Dragon (2000), Hero (2002) and House of Flying Daggers (2004) fame and Edko Films. The film will be released internationally by Universal International Pictures. For those of you who are not familiar with folk hero Wong Fei-hung, he lived in the late Qing Dynasty. He was a Chinese martial artist, physician, acupuncturist, and revolutionary, who became a legend. Rise of the Legend will once again tell the story of the rise of Wong Fei-hong from young kung fu student to the folk legend who protected the weak and helped the poor.